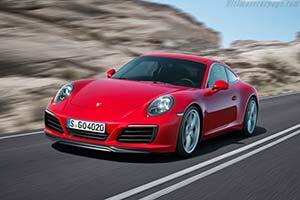 The 911 has been the world's best-selling sports car for decades. Now the new generation has arrived to further extend this lead. With innovative turbo flat engines, an advanced chassis with an even greater spread between performance and comfort and a new infotainment system it is exceedingly well-equipped for this. Thanks to more than four decades of experience with turbo engines - in both motor racing and production sports cars - the new engines in the new 911 Carrera set benchmarks in terms of performance, driving pleasure and efficiency. The rear-axle steering available as an option for the Carrera models for the first time further greatly extends the range of driving dynamics. Many exterior features of the 911 Carrera have been visually refined: these range from new headlights with four-point daytime running lights to door handles without recess covers, a redesigned rear lid with vertical louvres and new rear lights - including the characteristic four-point brake lights. In the interior the new standard Porsche Communication Management with a multi-touch display offers a considerably expanded range of functions and greatly simplified operation. The completely new engine generation with bi-turbo charging raises the emotional driving pleasure in the 911 Carrera to an even more intensive experience: 370 hp (272 kW) of power at the rear of the 911 Carrera is waiting to be unleashed and converted into sporty propulsion. The engine in the 911 Carrera S now delivers 420 hp (309 kW). In both cases this represents a power increase of 20 hp (15 kW). Both engines have a displacement of three litres. The greater power of the 911 Carrera S results from turbochargers with modified compressors, a specific exhaust system and tuned engine management. The new Porsche engines are characterised by significantly increased torque (60 Nm in each case) with maximum torque of 450 Nm and 500 Nm respectively delivered constantly from a low 1,700 rpm up to 5,000 rpm in both cases, thus ensuring excellent driving performance. At the same time with a maximum speed of 7,500 rpm the new engine generation clearly exceeds the top speeds of conventional turbo engines - underscored by the typical sonorous Porsche engine sound. Every new 911 generation boasts enhanced performance and efficiency compared with the predecessor. For example, depending on the model variant, the new engine generation is almost twelve percent more efficient: fuel consumption is reduced by up to a litre per 100 kilometres. The 911 Carrera with PDK transmission now consumes just 7.4 litres of fuel per 100 kilometres (a reduction of 0.8 l per 100 km), while the 911 Carrera S with PDK consumes 7.7 l/100 km (1.0 l less per 100 km). The new 911 also boasts impressive performance: the 911 Carrera Coupé with Porsche-Doppelkupplung (PDK) and Sport Chrono Package sprints from zero to 100 km/h in 4.2 seconds - making it two tenths of a second faster than its predecessor. The 911 Carrera S with PDK and Sport Chrono Package performs its showcase discipline in just 3.9 seconds (also 0.2 s faster). This means that it is the first 911 in the Carrera family to undercut the magic four second mark. And the top speeds of both models have also increased further: the 911 Carrera now has a top speed of 295 km/h (an increase of six km/h), while the 911 Carrera S now even reaches 308 km/h (an increase of four km/h). In conjunction with the optional Sport Chrono Package the 911 Carrera now has a mode switch on the steering wheel for the first time, derived from the hybrid mode switch of the 918 Spyder. The mode switch consists of a rotary ring with four positions for the driving modes "Normal", "Sport", "Sport Plus" and "Individual". Depending on the equipment, the latter setting enables drivers to configure their own individual vehicle set-up, for example the PASM, active engine mounts, PDK shifting strategy and sports exhaust system. In combination with PDK transmission the mode switch has an additional button, the "Sport Response Button". When this button is pressed the drivetrain is pre-conditioned for maximum acceleration for 20 seconds, for example before overtaking manoeuvres. For this, the optimum gear is engaged and the engine management adjusted to an even more spontaneous response for a short time. The 911 Carrera is the benchmark for driving dynamics of all-round sports cars. With every new generation Porsche further increases the spread between everyday comfort and circuit performance. For the first time, the new PASM chassis (Porsche Active Suspension Management), which lowers the ride height by ten millimetres, is a standard feature on board all Carrera models. It further improves stability during fast cornering. At the same time the new shock absorber generation with its wider spread characteristics enhance comfort thanks to an even more precise response characteristic and also improve the body connection during dynamic driving. New standard wheels with five slim twin spokes carry tyres with reduced rolling resistance and enhanced performance. Furthermore, on all variants the width of the rear rims has increased by 0.5 to 11.5 inches and the rear tyres of the 911 Carrera S now measure 305 instead of 295 millimetres. The active rear-axle steering that is available as an option for the 911 Carrera S is chassis technology adopted from the 911 Turbo and 911 GT3. It further enhances the turn-in behaviour of the 911. In addition, it makes for high driving stability when changing lanes at high speeds. At the same time it ensures greater manoeuvrability in city traffic thanks to the turning circle reduced by 0.5 metres. The improved handling is transmitted to the driver via the new steering wheel generation with a design based on the steering wheel of the 918 Spyder. The basic steering wheel has a diameter of 375 millimetres; the optional GT sports steering wheel measures 360 millimetres. For unlimited everyday practicality Porsche offers a hydraulic lift system with integrated lifting cylinders in the struts of the front axle. Pressing a button increases the ground clearance at the front by 40 millimetres within 5 seconds and thus prevents the vehicle underbody from hitting the ground, for example on steep garage exits. A standard feature of the new 911 Carrera models is the newly developed Porsche Communication Management System (PCM) including online navigation module and voice control. The PCM can be operated by performing multi-touch gestures on the seven-inch display, similar to operating a smartphone. User inputs by handwriting are possible, for instance. Mobile phones and smartphones can now also be connected via Wi-Fi. The smartphone tray being integrated for the first time in the centre armrest also offers battery-saving charging and optimised mobile phone reception. Also new is the option of connecting an iPhone to the PCM to use Apple CarPlay. Real-time traffic information is available for significantly improved navigation. It gives the driver a quick overview of the traffic situation and guarantees dynamic adaptation of the route to this information. Google Earth and Google Streetview are also being integrated for the first time to offer better orientation. Other components of the PCM are Porsche Car Connect and the Porsche Connect app, which can be used for such functions as remote control of vehicle functions, transfer of destinations to the PCM for navigation and use of music streaming services by third-party providers via the PCM. The 911 Carrera can now be customised even more precisely according to personal preferences with further new and improved assistance systems: the optional automatic speed control can now also brake moderately when the pre-set speed is exceeded, for example when driving downhill. The Adaptive Cruise Control ACC (option) now has a coasting function in conjunction with a PDK transmission. When driving in a queue the clutches are disengaged, thus saving fuel with unpowered coasting. The optional lane change assistant monitors traffic behind with radar and uses LED lamps in the left and right of the mirror triangle to warn the driver about approaching vehicles in the blind spot. In addition, Porsche increases the active safety of the sports car with the post-collision braking system as a standard feature.